They want information via mobile and in real time, and they look for brands who take corporate social responsibility seriously. It’s a new year, which means it’s time to reevaluate goals, tactics-and your customers. Technology and trends change quickly, and it’s critical to stay on top of what your customers will be up to in 2015. An infographic from Reuven Gorsht examines how customers shop, where they get information and what they expect from brands this year. Disregard advertising. 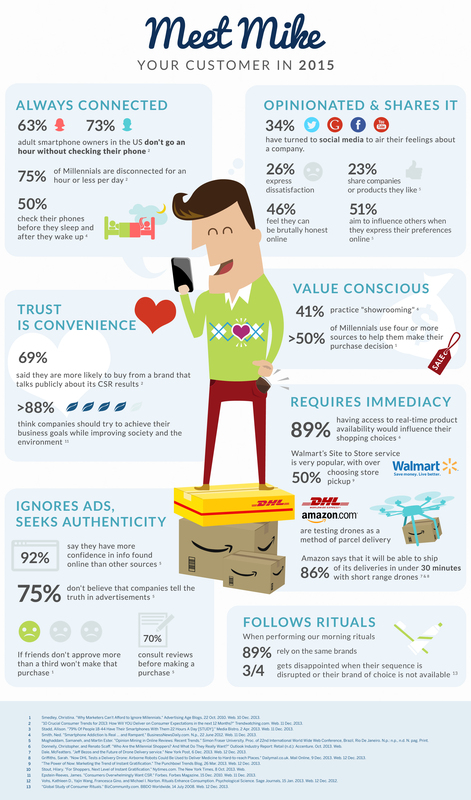 Seventy-five percent of people don’t believe companies are truthful in advertisements. Want real-time information. Eighty-nine percent of customers say having real-time product availability would affect their shopping choices. Pay attention to corporate social responsibility. Sixty-nine percent of customers say they’re more likely to buy from brands that publicly discuss their corporate social responsibility contributions than those that don’t. Are mobile. Seventy-three percent of men and 63 percent of women don’t go more than an hour without checking their phones. Trust the Internet. Ninety-two percent say they have more confidence in information they find online than anywhere else.